Replicating the success of 2016 Player of the Year promotion, Adda52.com once again has come up with POY in 2017. 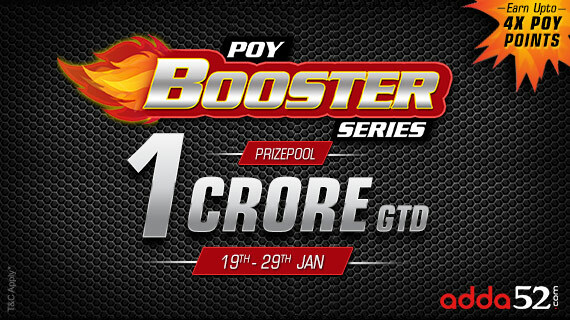 To take the advantage of POY 2017, Indian players can take part in POY Booster Series taking place from 19th Jan-29th Jan’2017 and stand their chance to win from a whopping prize pool of Rs. 1 Crore to kick start their New Year. The series is spread across 11 days and has 76 tourneys. The biggest events of POY Booster include 20 lac GTD Millions Booster, 20K High Roller Booster, 10 Lac GTD Mini Millions Booster, 7.5 Lac Booster and Republic 2.6 Lac Booster. Taking part in these events will not only fetch amazing prizes but also enable you to add upto 4x points to the 2017 POY Leaderboard in the very start of the year.